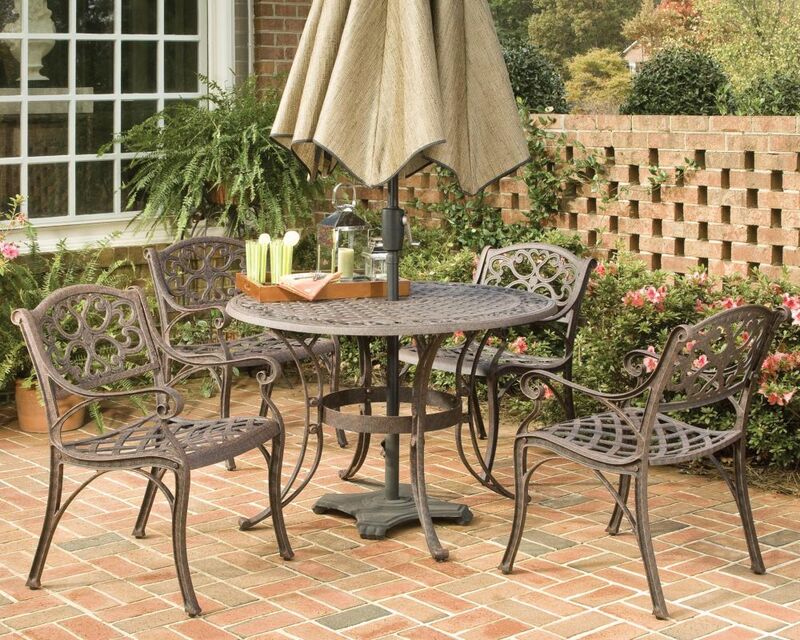 The Home Styles Biscayne 5-Piece Set includes a 48-inch Round Outdoor Dining Table and 4 Arm Chairs. This set is constructed of cast aluminum with a White finish. Features include a powder-coated finish sealed with a clear coat to protect the finish, an attractively patterned table top with a center opening to accommodate umbrellas, and nylon glides on all legs. Biscayne 5-Piece Patio Dining Set with 48-inch Bronze Table and Four Arm Chairs The Home Styles Biscayne 5-Piece Set includes a 48-inch Round Outdoor Dining Table and 4 Arm Chairs. This set is constructed of cast aluminum with a White finish. Features include a powder-coated finish sealed with a clear coat to protect the finish, an attractively patterned table top with a center opening to accommodate umbrellas, and nylon glides on all legs. Biscayne 5-Piece Patio Dining Set with 48-inch Bronze Table and Four Arm Chairs is rated 4.3 out of 5 by 4. Rated 3 out of 5 by displeased from why in the world would you sell outdoor patio furniture that can't be in the sun? How stupid. an... why in the world would you sell outdoor patio furniture that can't be in the sun? How stupid. and better still, not reveal this problem until it is paid for and delivered. Rated 5 out of 5 by JCNC from Easy to assemble, lightweight yet sturdy. Easy to assemble, lightweight yet sturdy. Rated 4 out of 5 by Janet from Have been waiting a long time to buy this set.... Have been waiting a long time to buy this set. It arrived several days ago. I was able to put the chairs together as they were small enough to bring inside. But ithas been too cold to put the table together. Appears the be made very well. Was packed and shipped well. Rated 5 out of 5 by TownhouseOwner from Product meet and exceeded expectations. The Table and chairs were easy to assemble but I would re... Product meet and exceeded expectations. The Table and chairs were easy to assemble but I would recommend using your own wrenches - the tools provided were flimsy and extended the time complete the assembly. Would not recommend spending the money on white glove delivery. We did know the four hour time frame for delivery which was beneficial but once they arrived all they did was walk the boxes up to the lanai. My recommendation would be to have the package standard delivery and move them yourself if you have someone to help.